Stipe Miocic spoiled Roy Nelson’s chances of getting closer to a title shot, as he thoroughly dominated “Big Country” over three rounds of action in the co-main event of UFC 161. Miocic battered Nelson on the feet on his way to a lopsided unanimous decision victory with scores of 30-27 across the board. 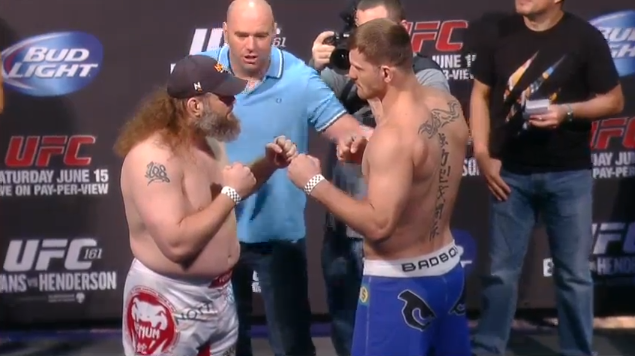 Roy Nelson came forward to start, winging his powerful right hand as Stipe Miocic looked to circle out of trouble. Nelson managed to land early, but the story of the round was Miocic as he got on track with his straight combinations. Miocic used a stiff jab to set up his powerful straight right hand to take over the round. Miocic later connected with a flurry that staggered “Big Country.” Nelson survived but Miocic continued to land inside with elbows and uppercuts. Miocic picked up where he left off to start the second, landing with laser straight punches down the middle. Nelson fired back with looping strikes, but Miocic easily circled out of trouble. Miocic punished Nelson with a pinpoint accurate jab as he seized control of the bout. A winded Nelson continued to pursue but was outgunned in each exchange as the round wore on. Miocic continued to pour it on with stinging combinations that all found their mark. Miocic’s jab was on full display to start the final stanza, as Nelson simply had no answer for his attack. Time and time again Miocic connected at will while Nelson kept marching forward. Miocic continued to score with his jab as Nelson desperately tried to connect with anything of significance. A final flurry capped off a dominating performance from Stipe Miocic. There would be no surprise on the scorecards (30-27, 30-27, 30-27), as Stipe Miocic improves to 10-1 overall (3-1 UFC) with his best UFC performance to date.